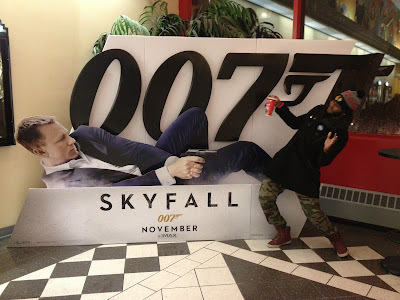 Earlier this week, I attended the premiere of the new James Bond film Skyfall (In theaters this Friday in the US). A big shoutout to the great folks at Cadillac & GM Northeast for inviting me to see the film early. I knew that the new Cadillac vehicles were the kind of cars built for Mr. Bond, anything less would be uncivilized. Skyfall is a pretty awesome film. This film truly pays homage to the classic Bond series, you will love the classic references if you are a die hard Bond Fan. I won’t go into detail about what they refer to because then that would be a spoiler and we don’t spoil films here on TerryMcfly.com. Skyfall is more than a movie, it’s an experience! The high octane action, beautiful women, and beautiful cars will keep you on the edge of your seat thirsting for more. There’s also an arsenal of weaponry I guarantee you have not seen in any other film. Kudos to whoever is responsible for the wardrobe. James Bond looked very dapper in every single scene, I never saw someone dressed so well staring in the face of death. I need the James Bond wardrobe in my closet now!!!! This film made me want to start wearing well tailored suits on a regular basis. Supporting Actress Naomie Harris is the newest Bond Girl. 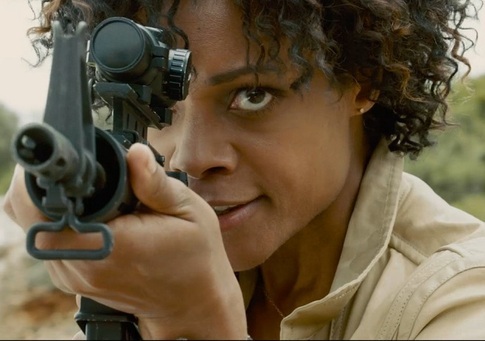 She takes on the role as Eve MoneyPenny (M’s assistant). Her British accent had a brotha weak!!! I love British accents, especially when its complimented by a beautiful physique. I am going to see this movie again when it hits theaters, but this time in IMAX! Skyfall is “Terry McFly Approved!” This just may very well be one of the best Bond films that Daniel Craig has ever starred in.